Our fully equipped 6500m2 (70,000 square feet) sales facility is located in Richlands, Australia. We are well situated for shipping machinery Australia wide and overseas from the Port of Brisbane located only 45 minutes away. Our workshop has facilities and skilled personnel for complete mechanical overhaul, welding, fabrication, sand blasting painting, service, maintenance and testing, and is fully equipped for carrying out inspections. This gives us the capability to bring used heavy machinery up to the standard you require, and is reassurance that it is reliable and able to do the job to which you require. Refurbishment, inspection, testing, rebuilding and painting is carried out at our workshop in Richlands. We have a team of professional engineers and mechanics with in-house facilities for repair and maintenance and full refurbishment, meaning we are not reliant on outside services or suppliers to meet deadlines. 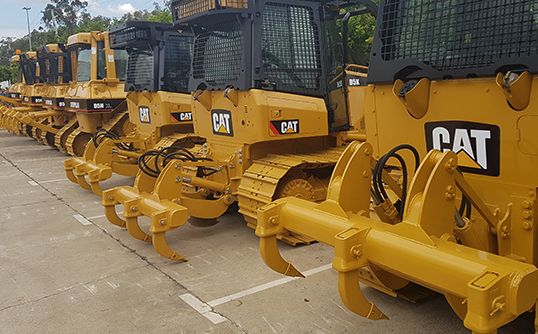 We carry out inspections to our own very high standards as well as work with independent organisations such as reputable Caterpillar Dealers. We oversee logistics from our Richlands, Australia headquarters conveniently located for shipping nationwide and overseas. These services include taking care of customs and export documentation and insurance as well as organizing the road transport, delivery to port, handling, loading and shipping. If RORO loading is not possible for certain destinations, we are able to dismantle machines for shipping in containers or on a flat rack. We will endavour to contact you within 24 hours to discuss your requirements and find out how we can best service your organisation.